Advertisers can build a Custom Audience from an existing customer list compiled by information obtained from Lead Ads and sign ups, among other avenues. 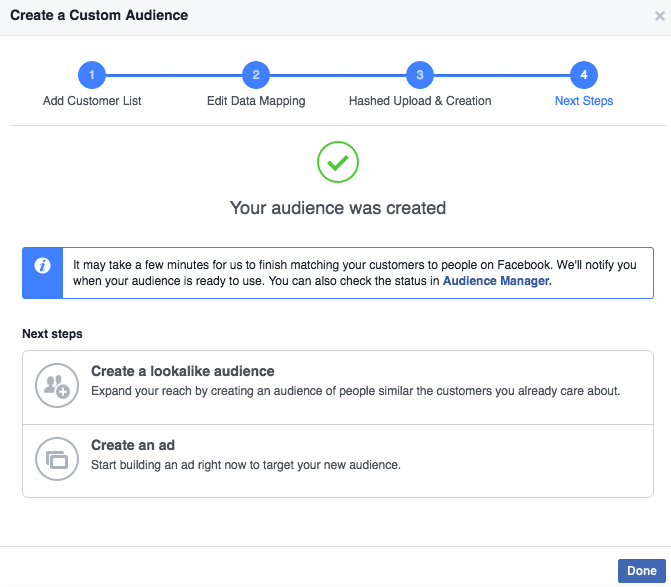 With a Custom Audience uploaded, Facebook can better target your ads. For instance, if you obtained contact information from a Lead Ad, the users who filled the form are more likely to respond to your ads. 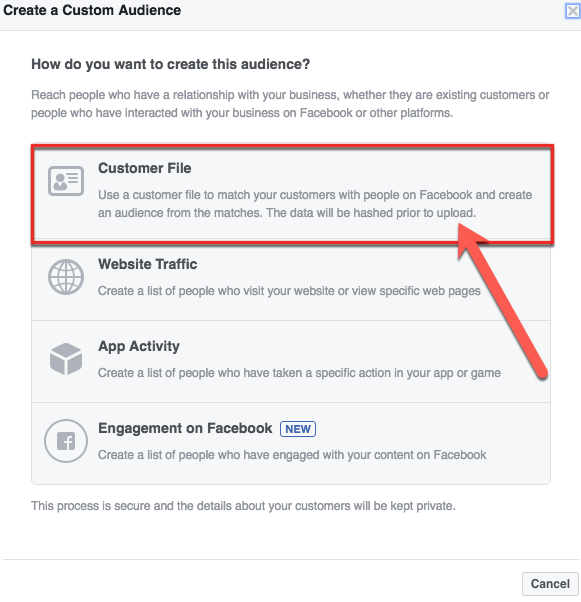 Thus, Custom Audiences allows advertisers to target those who have already expressed interest in their business. Usually, advertisers upload an excel sheet filled with their customer’s information. If this sheet is not formatted correctly, an error message will appear and prevent you from uploading your Custom Audience. To prevent complications, follow the formatting guidelines below. Always include the country code on phone numbers even if all the data come from the same country. Always include your customers’ countries in their own column in your file even if all of your data is from the same country. Email email We accept up to 3 separate email address columns in US and international formats. Phone Number phone Phone numbers must include a country code to be used for matching. For example, a 1 must precede a phone number in the United States. We accept up to 3 phone numbers as separate columns, with or without punctuation. Important: Always include the country code as part of your customer’s phone numbers, even if all of your data is from the same country. First Name fn We accept first name and first name initial, with or without accents. Initials can be provided with or without a period. Last Name ln We accept full last names with or without accents. City ct We accept full city names as they normally appear. State/Province st We accept full names of US and international states and provinces, as well as the abbreviated versions of US states. Country country Country must be provided as an ISO two-letter country code. Important: Always include your customers’ countries in their own column in your file, even if all of your data is from the same country. Because we match on a global scale, this simple step helps us match as many people as possible from your customer list. Date of Birth dob We support 18 different date formats to accommodate a range of month, day and year combinations, with or without punctuation. Age age We accept age as a numerical value. Zip/Postal Code zip We accept US and international zip and postal codes. US zip codes may include a 4-digit extension as long as they are separated by a hyphen. The extention is not required and will not further improve match rate. Gender gen We accept an initial to indicate gender. Mobile Advertiser ID madid We support 2 types of mobile advertiser IDs: Android’s Advertising ID (AAID), which Google provides as part of Android advertising, and Apple’s Advertising Identifier (IDFA), which Apple provides as part of iOS in its ads framework. Facebook App User ID uid An ID corresponding to someone who uses an app that can be retrieved through the Facebook SDK. 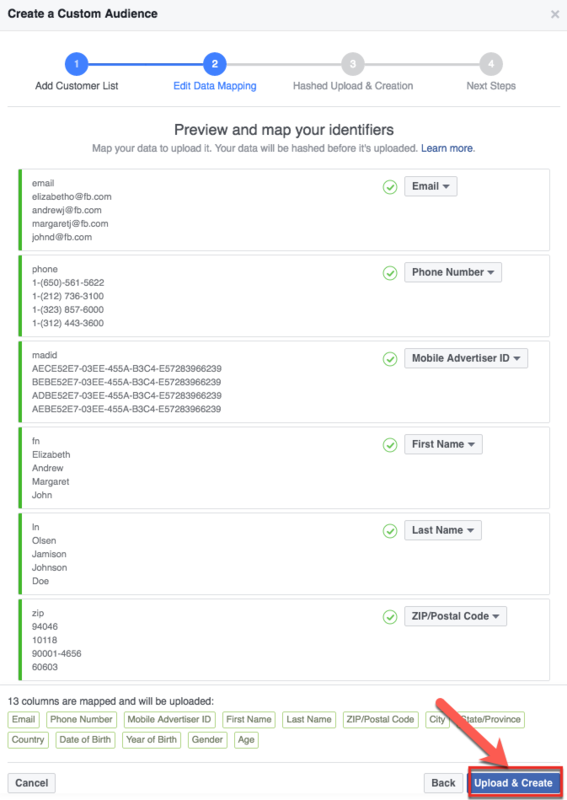 We support numerical user IDs associated with your facebook application. 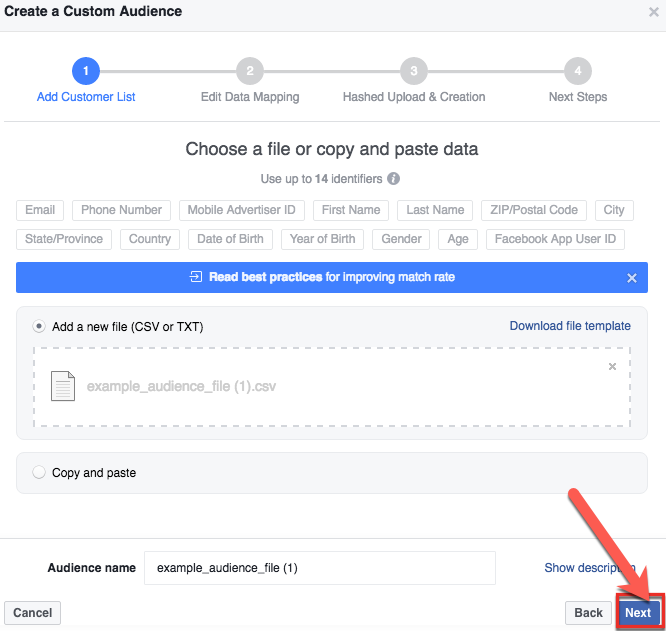 To upload data using Facebook Custom Audience on Business Manager, simply follow the steps below. Create Audience is located under Audiences. Custom Audience will drop down under Create Audience. Customer File is the first option. Afterward, click “Choose a file or copy and paste data“. Click “Upload File” to upload your data. After you choose a file, click “Next” to proceed. 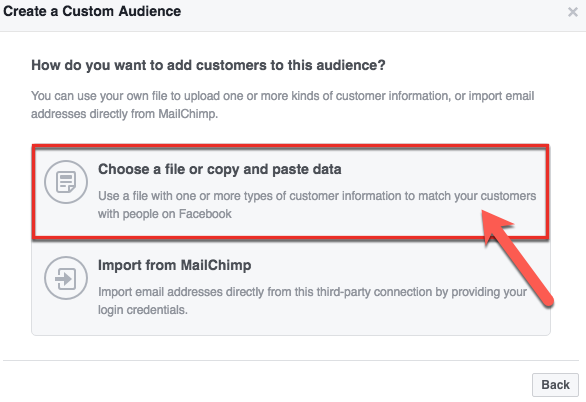 After uploading your data, click “Update & Create” to create your custom audience. 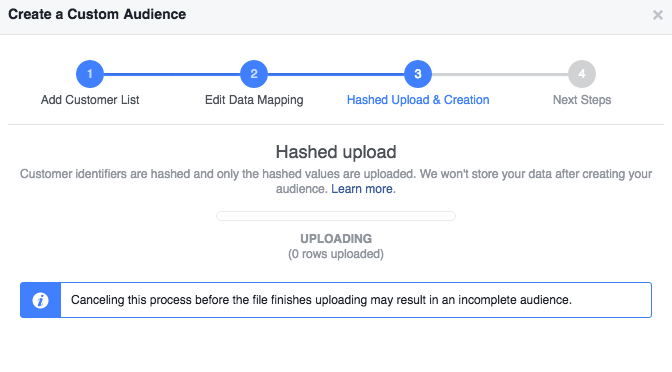 Depending on your data size, upload time may be quick or slow. Congratulations, you’ve uploaded Custom Audience data using Multiple data types! 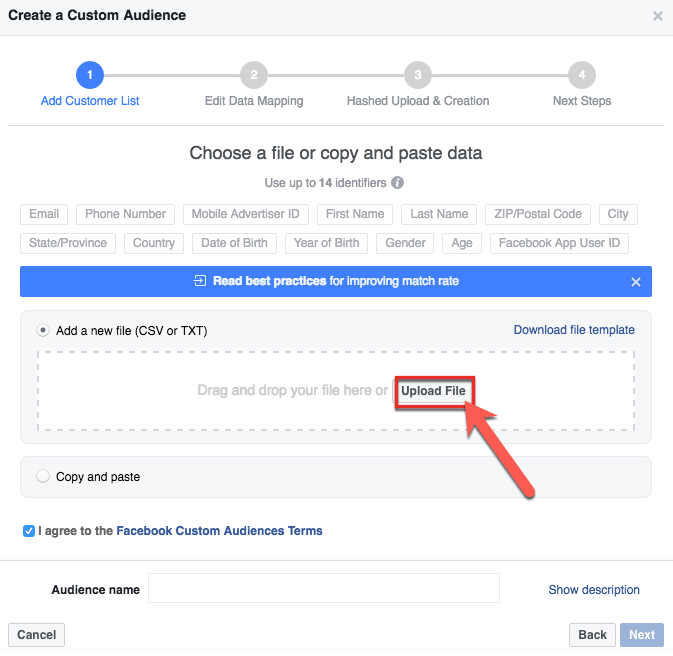 Was this How To article about uploading a Facebook Custom Audience on Business Manager easy and informative? Leave your thoughts on the comments section below!